I have for sale a Sigma 19mm f/2.8 DN Art lens for Sony E-mount in *EXCELLENT* Condition! Lens was purchased new by me and has been very well taken care of. Comes with box and papers as well as front and rear caps, sunshade, and padded case. Bid with confidence as I have 100% positive feedback! Condition is New. Its 35mm focal length equivalency is 28.5mm and its minimum focus distance is 7.9" (20 cm). Its f/2.8 maximum aperture is ideal for shallow depth of field imaging and allows it to maintain sharpness in low light situations. Sigma EX 19mm f/2.8 DN EX Lens For Panasonic/Olympus/Four Thirds. Condition is Used. Shipped with USPS Priority Mail. 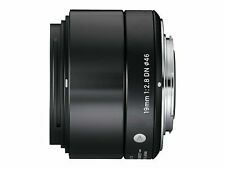 New ListingEXC++ BOXED SIGMA 19mm f2.8 EX DN LENS FOR SONY E MOUNT, CASE, CAPS, INST. Sigma 19mm f/2.8 DN ART Lens - Front Lens Cap - Rear Lens Cap - LH520-03 Lens Hood - Carrying Case - Sigma USA Warranty -Bundle includes: - Pro Optic 46mm Digital Essentials Filter Kit, (with Ultra Violet (UV), Circular Polarizer and Neutral Density 2 (ND2) Filters, with Pouch) - Adorama LP99 LensPen Lens Cleaner - Flashpoint CapKeeper 2 (Model CK-2) Lens Cap Leash (1 piece). Good Condition, Working Pull, Guaranteed Fully Functional. Cosmetically in good condition showing a few scuffs and blemishes from previous use. Pictures are of the actual item for sale. On hand and ready to ship..
Sigma 19mm f/2.8 DN ART Lens, Silver - Front Lens Cap - Rear Lens Cap - LH520-03 Lens Hood - Carrying Case - Sigma USA Warranty -Bundle includes: - Pro Optic 46mm Digital Essentials Filter Kit, (with Ultra Violet (UV), Circular Polarizer and Neutral Density 2 (ND2) Filters, with Pouch) - Adorama LP99 LensPen Lens Cleaner - Flashpoint CapKeeper 2 (Model CK-2) Lens Cap Leash (1 piece).